Tucked away in a corner of the Historic Dockyard is a hidden treasure that pre-dates the Battle of Trafalgar – The Porter’s Garden. He could also sell beer in the summertime, ‘such as is fitt to quench the parties thirst that drinks thereof, & to enable him the better to perform his Labour, & not such as will distemper them’. 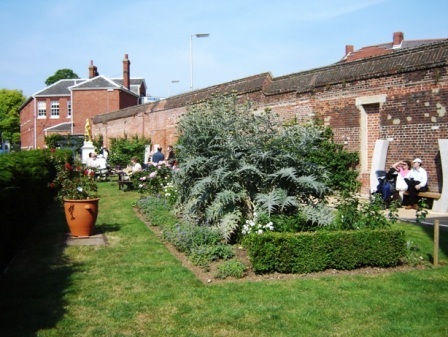 In the post war period the garden fell into a variety uses (including housing temporary police cells) until in 1998 the Friends Committee was founded. Following a restoration programme by volunteers the Porter’s Garden opened to the public in 2001. Naval voyages brought back exotic plants such as bottlebrush, agapanthus and Leptospermum, family myrtaceae, a plant from New Zealand. Today you can see a whole host of plants, many of which have nautical connections including Armeria maritima (sea thrift), Clematis viticella “Mary Rose”. As part of Portsmouth’s Trafalgar 200 celebrations, on Monday 21 March 2005 at noon (on the same day and time that the battle of Trafalgar began in October 1805), Dr Colin White of the Royal Naval Museum opened the chequered yellow and black Nelson Border. The black and yellow violas represented Admiral Nelson’s particular style of painting the gun port lids of his ships black, against a yellow ochre stripe, to distinguish them from enemy ships in dense battle smoke. There is plenty of other wildlife too – nesting blackbirds, visiting foxes, butterflies and bees and even a recently a crab that had scuttled well off course! In 2006 a colony of Red Mason bees will be installed in their own home to aid pollination. The environment is an important concern too. Before planting the volunteers collected and dug in loads of well-rotted horse manure. Then the Friends purchased compost created by the Council from leaf mould and tree clippings, but now the garden creates most of its own compost by recycling green waste clippings and plants. No insecticides are been used apart from beer traps for slugs. Some slugs are carefully relocated! The garden recently released 200 extra volunteers in the shape of earth worms into the beds. Human volunteers dug 5 inch holes and “planted” 8 to10 worms in each. It is hoped that these will aerate and improve the soil quality. The garden is supported by the Onyx Environmental Trust, who recently funded a scheme to create seating in the garden. With this grant the Friends of the Porter’s Garden were able to commission sculptor Roger Stephens to create three seats made from granite re-cycled from Portsmouth Dockyard. The three seats represent the midship sections from Mary Rose, HMS Victory and HMS Warrior 1860. Hampshire Gardens Trust also supported the Sculptured seating project. The garden is also supported by Portsmouth City Council’s Children’s Fund, which donated £900 towards the Knot Garden and children’s activities. Two Portsmouth schools submitted drawings for a knot garden and the two winning designs were incorporated into the final garden. The Porter’s Garden is always looking for new volunteers to help out. You don’t need to be a gardening expert and need only come along only as frequently as you are able. There is plenty to do even at this time of the year. There are volunteer mornings each Wednesday and there is an open weekend the first weekend of every month. - November to March - 10.00am to 5.00pm.